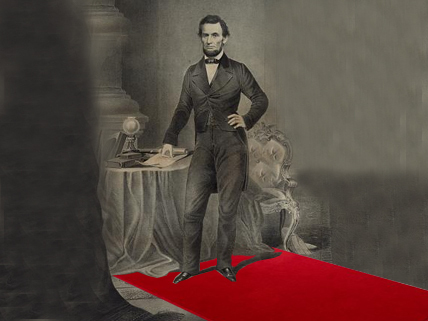 Though he’s been depicted countless times before on the silver screen, more than any other American president by far, Abraham Lincoln has burst anew onto the Hollywood scene in 2012. The current portrayal of our 16th president by two-time Oscar-winner Daniel Day-Lewis in Lincoln, directed by Steven Spielberg, is indeed enough to make moviegoers forget Tim Burton’s campy Abraham Lincoln: Vampire Hunter send-up this past summer—well, almost. Historians love to scrutinize cinematic versions of real events and characters for their factual inaccuracies (such as that Lincoln was not actually a vampire hunter). Even Spielberg’s highly acclaimed Lincoln is not without a few minor deviations. Of course, the odds are that a film of this quality will impress history’s lessons far more deeply than any textbook or lecture. Those lessons, such as how to practice the art of political compromise, are well worth learning—and not just by students. Lewis portrays Lincoln superbly, and the plot presents one of the grand moral and political challenges that he faced and overcame: opposition to the proposed Thirteenth Amendment to abolish slavery. Having steered the Union through four years of dreadful war—its end now in sight—Lincoln knows that a constitutional change still must be effected, or all might be in vain. He fears that the emancipation of the slaves, which he proclaimed as a wartime measure, won’t stand up in court once the conflict has come to an end. And he sees more clearly than others that most whites at the time, including those in the North, are not likely to care about the fate of Southern blacks if war no longer threatens. Lincoln therefore pushes hard for the abolition amendment, pitting all his masterful political skills toward its passage. At the same time, he knows he can’t be viewed as spurning peace overtures from the Confederacy. And throughout it all, he struggles with profound marital and family tensions. Check out this historians’ blog that reviews the new movie with an eye to historical accuracy. Check out this entertaining “video essay” on Lincoln in film, TV, cartoon, you name it—the only thing missing is “Honest” Abe in the 2010 GEICO commercial. An invaluable resource on all things Lincoln: every time and place Lincoln has been depicted in popular culture, from statuary to poetry to fictional depictions including cinema. Instead, what if we place the coins in three dimensional space, with the four pteisdenrs standing in a line facing the same direction. The difference in profiles would place us (the viewer) in between Jefferson and Lincoln. The symbolism here would be that these four pteisdenrs would all be looking forward, into the future, as we all look backward. Because their faces are on coins, and the united states uses a fiat currency, we can assume that these great forward looking men are telling us that we place an imaginary sense of grandeur on our past. Maybe I’m reading too much into it. He looks fabulous! Quite the star! Where Is Carmen Sandiego? She’s Back!